Good catch, my fault there thank you. *   1) for hubitat only added support for executing any device any command to rules. *   2) added option to reset ENGAGED if contact stays open but still room was engaged using another device like power. *   3) added option for LOCKED to override other devices that trigger other states. this excludes buttons that activate another state because by pressing a button user is expressing explicit intent to switch to that state. *   4) added option to view all settings page to show a non-anonymized version for user to view locally. *   6) updated settings in rooms manager to be more uniform. *   7) added device health check with option to notify via speaker and/or color. this checks if the device has communicated with the hub in X number of hours, where X is configured through settings. *   8) for hubitat only added option to check additional devices for device health even if those devices are not used with rooms. sorry for the delay with this update. 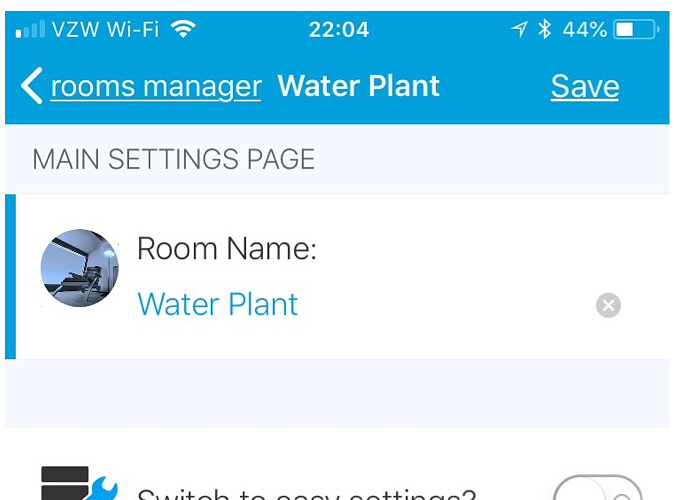 *   1) added icons to main settings page for a room in hubitat. ST already shows these icons on the settings page. *   2) added option to hide advanced settings. *   3) added setting to adjust cooling and heating temperature by 0.5ªF when outside temperature is respectively over 90ªF and below 32ªF. *   4) rewrote temperature management to be more consistent. *   5) cleaned up rooms manager settings. *   6) added option for how often device health message should be announced. *   7) fixed a bug here and there. posted the corresponding versions of this on the other forum so sharing here as well. Here is a summary of features for the quick reader. Turn on and off lights / switches. Auto adjust level and color temperature when turning on lights. Set light color when turning on. Setup recurring schedule for holiday light shows including annually recurring holidays. On Hubitat send any command to any device. Start and stop music players. Maintain room temperature with thermostat or in-room AC and heaters. Turn fan on/off and manage fan speed with room temperature. Control vents with room temperature. Setup multiple color routines for holiday light shows. Turn on night lights with motion while room state is asleep. Set alarm to play on a daily or weekly schedule for each room. Check and announce device battery status. Check and announce device health monitoring status. Announce arrival and departure including with randomly selected messages. Announce time every quarter, half or on the hour. Announce when door stays open. Announcements support speakers and / or lights for making announcements. I think the adjacent room settings are no longer functioning properly. I am no longer seeing rooms change to the checking status when motion is detected in an assigned adjacent room. thanks for letting me know … will check. *   1) added occupany icon to rooms device state for use with Hubitat. *	4) optimized performance of device health check on Hubitat. *	5) started cleaning up code for room state replay. *	6) added option to announce sunset and sunrise with speaker along with the color option that was already there. *	7) added more granular control for window shade level. *	8) added processing for room cool or heat rules on room state change. *	9) swatted a bug here and a bug there. you are right the device subscriptions for adjacent rooms are not working right. will dig further tomorrow … should have a fix by saturday. fixed. stupid typo. will release code tomorrow. You are amazing, great support for this as always! *	3) added room button so you can use a single button to rotate thru selected room states. *	4) added support for mode in rooms manager in which to make announcements. *   5) added option to remove devices from health check. *   6) fixed a couple of bugs. I love this idea, unfortunately I can’t get it to work. It turns on the lights, but never changes away from Occupied afterward. Turns out I chose enable the Switch to easy settings. Whatever is in there I did, failed to work. I switched to advanced settings and now the countdown is working properly. if its not switching away from occupied state generally the reason is no timeout value for occupied has been set. so things are working now as they should? please dont hesitate to ask if i can clarify anything. I do recall that I had tried to set the timeout value to several different values, with no affect. I also noted in the Recent Activity that the timeout was always reported as 0s. It is working now. I stopped using the Simple Settings and that seemed to do it. Only question I have, relates to lux. I noticed the instructions seem to indicate that lux sensor value <= setting value check is possible. I could turn lights on when it rises above a value, but can I prevent them coming on if the lux sensor value >= setting value? yes. in maintain rules on any rule if you specify a lux value that rule will only be executed when lux from device is <= that value. every rule evaluates the conditions or time triggers specified on that rule before being executed. Spent my day off today transitioning my complex pistons for occupancy and presence into Room Manager. I’m very impressed this far. Really helping me optimize. no better way to spend a day off … even if i say so myself. that was always the hope … thanks to users like you who make it possible. updated to github with the following changes. NOTE the breaking changes below. *	1) BREAKING CHANGE: added color options in rooms to support the same colors as supported in rooms manager already. *       you will need to update any color settings for rules after this update. *	2) added option to select between pushable, holdable and double tap buttons on Hubitat. *	3) added support for multiple types of speaker devices for rooms child so those are available for announcements. *	4) added support for light bulbs to support announcement in each via color. *	5) added support for some announcements for doors and windows in rooms. *	6) optimized code for processing adjacent rooms when updated from rooms settings. *		device that is of type switch. *	8) added more details for temperature rules when shown in view all settings. *	9) added option to support fans that only support on/off but not level settings. *	10) changed how time scheduling is handled to work around how infrequent Smartthings issue with sunrise and sunset. *	11) added support for variable volums to announcements. *	12) swatted a bug here and a bug there. *   13) BREAKING CHANGE: added multiple different occupancy icon sizes for use with Hubitat dashboard. *       you will need to update any dashaboards using occupancyIcon to use one of the new icons of different sizes. *	14) added image URL for occupancy icon for use for when Hubitat supports state attributes for image URL in dashboard. *	15) add a few more tiles for SmartThings for missing attributes like outside temperature, vents and couple of others. *	16) updated readme for github.